What exactly does that mean. You get 1 hat/day if you gift/win a duel or buy a map stamp? It appears you have to buy the most stamps, win the most duels or gift the most in a day for the chance to have the hat assigned for a whole day! Seems like another thing that only people with way too much money on their hands will ever manage to acquire. Sounds kinda lame yeah. I guess the map stamps is good too support community made maps, but the other two is kinda meh. Also, do you get the hat for just a day or permantly? If not permantly, it's even more lame. There's a new setting for hiding the crosshair (either stock or custom) while zoomed in the scope of any sniper rifle, leaving just the laser pointer of the rifle itself. Two new crates added and #43 retired and good riddance to it as well. 47 Means the Strange FAN & Tomislav are here with the S Flamethrower back in circulation. Odd choice on that as I was expecting the Scattergun. 48 is a special bud the description on it is bizzare. 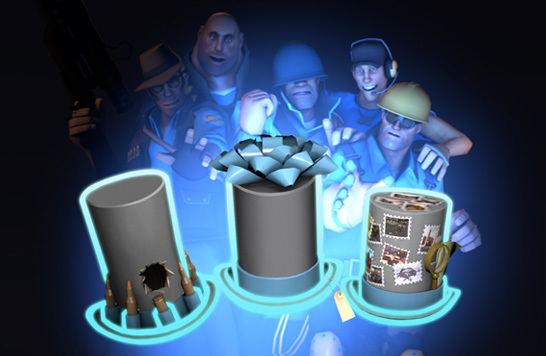 Contains either a Robro or an Unusual but although the crates are about the keys aren't available yet. Well they seem to have changed their mind on the Robro (booooooooooooooo!) and apart from two new pets I can't say any of it interests me. Do like that Koala though. I must say I now stand corrected. The stuff actually looks better than a lot of the pictures show. The Track Terrorizer for scout goes really nice with some of the other kit for him. The War Pig's 2nd style appeals to me a lot more and of course the Heavy hat is pure Jesse Ventura in Predator. Not a bad crate at all for cosmetic stuff but the Soviet Gentleman will be renamed. Updated MissionCycle behavior. Servers will always cycle to a mission listed in the MissionCycle file.